Back in early August 2014, never in the widest realms of possibility did it appear plausible that either Congo or Equatorial Guinea would be even competing at the 2015 AFCON, yet by a remarkable twist of fate the pair will meet on Saturday in that very tournament’s opening fixture. Both had at that point seemingly suffered elimination before qualification had reached its full swing, Equatorial Guinea exiting following the fielding of an ineligible player in round one against Mauritania and Congo a hurdle later via a gut-wrenching penalty loss to Rwanda. The pair though would each receive a reprieve of differing circumstances. 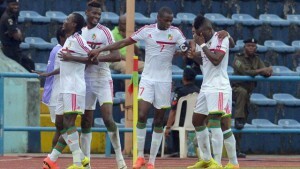 Equatorial Guinea’s ticket back in arrived in the form of offering CAF the olive branch of a host venue after Morocco’s withdrawal, whilst Rwanda being found guilty of employing an ineligible player granted Congo an unexpected second chance – one which Claude Le Roy’s men fully utilised to secure a first AFCON showing in 15 years. If either side harbours genuine aspirations of extending their AFCON adventure beyond the group stage, Saturday’s curtain raiser in Bata should be considered critical. With Burkina Faso and Gabon understandably highly-fancied to advance from group A, defeat for Congo or Equatorial Guinea would likely prove terminal to any potential route into the last eight. At the same time, a draw would also do little for either’s hopes of progression. Newly-appointed Equatorial Guinea coach Esteban Becker will look to draw on the inspirations of his side’s last stint as hosts, where an opening victory over Libya propelled the national thunder to an unprecedented quarter-final spot. Nonetheless even accounting for the spirit of three years ago and home advantage, Congo will take to the field as favourites against an ill-prepared side currently ranked at a lowly 120th in FIFA’s world rankings, who possess a squad of largely unfamiliar Spanish lower league based personnel. The Red Devils have, however, seen their preparations hit by extensive logistical problems, with Le Roy painting an accommodation picture of room shortages, exposed electrical cables and a lack of running water. Equatorial Guinea would be forgiven for hoping such difficulties will prove pivotally detrimental to Congo’s chances in the tournament opener. Another question mark hanging over the Congolese is that arguably theirs is the tournament’s most inexperienced squad in relation to AFCON experience, although hopes will be that the vastly-experienced Le Roy – managing remarkably in his eighth tournament – can act as an equalising factor in this regard. Previously Congo might have struggled for attacking edge against a determined side who are liable to prove difficult to breakdown. However, the addition of Thievy Bifouma and the blossoming of his strike partnership alongside Férébory Doré has brought about a greater degree of bite. With those improvements in place, there is only minimal evidence to suggest Le Roy’s side won’t mark their return to Africa’s grandest stage with a victory, providing they channel their nerves. For Equatorial Guinea, avoiding defeat and thus merely ensuring their campaign at least remains alive until the group stage concludes should be considered a positive result. However this is the AFCON – a setting where history suggests miracles can materialise – so an inconceivable victory for the hosts should not be ruled out completely.